Adobe Experience Manager- a web content management system enables users to create, edit, manage and optimize websites across different digital channels such as the web, mobile, and social. It is a digital experience management and delivery solution that helps marketing and IT conquer the content management challenges so that businesses can deliver connected digital experiences across the customer journey. The solution helps in building brand loyalty and driving demand from online to physical interactions. It is composed of 5 key offerings that are essential to an organization’s ability to deliver digital experiences to where customers want to engage. Strengthen the brand preference through personalized experience. Boost revenue through incremental sales from existing or converted customers. Improve loyalty through valued & unique customer interactions. Reduces customer churn and ensures lower costs of marketing. Adobe Experience Manager is a best-of-breed content management & digital asset management system that integrates seamlessly with dozens of top analytics and marketing tools. Combined with the other offerings from the marketing cloud stack, it provides a powerful, modular and extensible platform that serves the need for marketing & web experience management. Prebuilt integration with Analytics & Target products to gather insights. Email marketing platform integrations & campaign dashboard creation & monitoring for multichannel, multi-device campaigning. Prebuilt e-commerce integration for promoting brands recognition. Sharing digital content and assets across channels & rendering it for multi-devices. Provides unlimited segmentation of audiences, visitor trend analysis, and cross-visit analysis thus gaining significant insight into visitor characteristics. Multi-channel & multi-device campaigns for the optimization of ROI & monitoring the results through dashboards. Social plug-ins allow management of corporate blogs, comments & ratings. 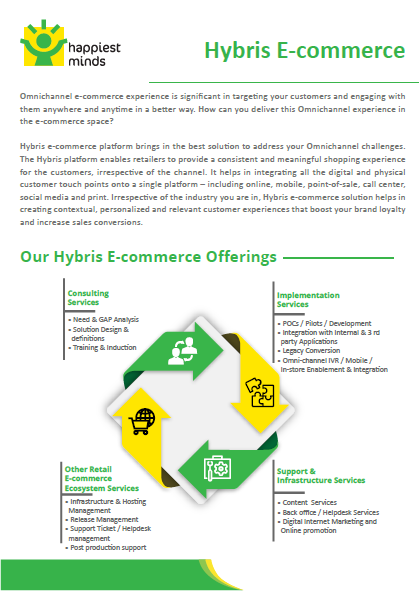 Allows pre-built integration features to leading e-commerce system like Hybris, providing an e-commerce management platform. Low costs in infrastructure & maintenance as the service is cloud based offering extensive customization and security. Managing multiple websites with no duplication effort, consistent design & branding & reduced communication between marketers & leadership. Analytics solutions using Adobe Analytics consolidate customer data to provide relevant engaging experiences across-devices and cross-channel. Adobe Audience Manager identifies, quantifies & optimizes high value target audiences, which can then be offered to advertisers across all marketing channels. Adobe Target solution allows you to deliver the right experience to the right customer at the right time. Digital Marketing Cloud Solutions helps customers in addressing the Omni-channel digital marketing challenges.